Thalassa is a goddess of Ancient Greece, although not one mentioned across all sources, but when referred to, Thalassa was considered to be the Greek goddess of the Sea. In the most general terms, Thalassa was regarded as a Protogenoi, a primordial deity of the Greek pantheon, but the goddess is not one that appears in Hesiod’s Theogony, the most oft used source for names and genealogy of the Greek gods and goddesses. In Hesiod’s work the Protogenoi god of the sea was Pontus, but is in the Fabulae (Hyginus) where Thalassa is mentioned. Hyginus tells of Thalassa being the daughter of Aether (Light) and Hemera (Day), which does of course seem strange parents for a sea deity. As a sea deity, Thalassa was considered to be the actual personification of the sea’s water, specifically the water of the Mediterranean. Now some might believe that the sea was cruel beast, but in Aesop’s fables Thalassa would claim that she was a calm goddess, and the dangers of the sea where brought about by the actions of the winds, the Anemoi. As a parent Thalassa is named as the mother of Halia. A sea nymph of Rhodes who became a lover of Poseidon. ​Also, Thalassa is considered the mother of the fishes, by Pontus, but the origin of the fishes is given to many of the other sea deities of the Greek pantheon. It was occasionally said that Thalassa was the mother of Aegaeon, a Hecatonchire, possibly fathered by the storm god Aegaios, but Aegaeon is normally simply considered to be an alternate name for Briareos, and the Hecatonchires were more widely recognised as children for Gaia and Ouranos. 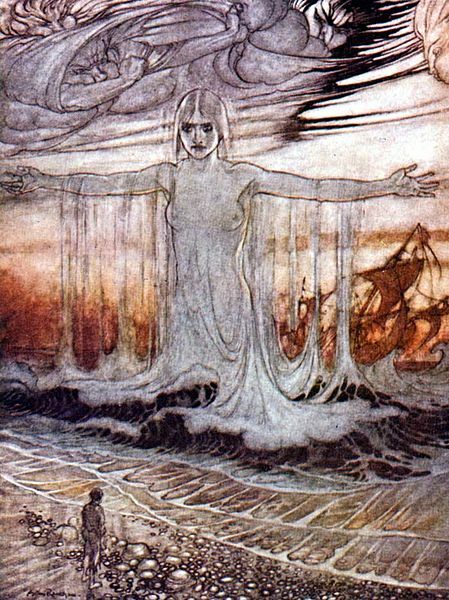 Thalassa is also sometimes named the mother of the Telechines, the four sea smiths, though again they are more commonly referred to as the sons of Pontus and Gaia. Also Thalassa is named mother of Aphrodite, but again it is more common to think of Aphrodite being born from the severed member of Ouranos as it hit the sea foam.